Middle Fell is a splendid little fell on the approaches to Wasdale, squeezed into a small space between Greendale, Nether Beck and Wast Water. Although the fell falls below 2,000ft it has great views of Wast Water, up towards the Scafell range and over Wasdale Red Pike. The top of the fell is a rocky ridge that runs north-south between the becks, lined with crags on sides, but with the most dramatic rock scenery to the east and south. The steep rocky sides mean that Middle Fell is best approached from either end - the northern route comes past Greendale Tarn to the area overlooking Nether Beck then turns back to climb up the fell, while the southern route branches off the main path just during the first steep climb up from the valley bottom. Our walk on Middle Fell combines both routes, climbing up the northern end and down the southern. The summit is a fine rocky place at the southern edge of the long ridge, with a great view of the famous Wastwater Screes. Middle Fell is bordered to the west by Greendale Gill. This merges with Cinderdale Beck just to the south of the road at Greendale and the combined becks, known as Countess Beck, form the southern boundary before running into Wast Water. Nether Beck forms the eastern boundary of the fell. A few minor becks rise on Middle Fell. At the very northern edge is Standy Gill, which flows into Nether Beck and could be seen as the northern boundary of the fell. To the south Goat Gill and Smithy Beck both run down in the Wast Water as do a couple of unnamed tarns. Middle Fell has a half-share in Greendale Tarn, which sits between itself and Seatallan. Middle Fell could be seen as a broader, less dramatic, copy of Yewbarrow, the next fell up the valley. 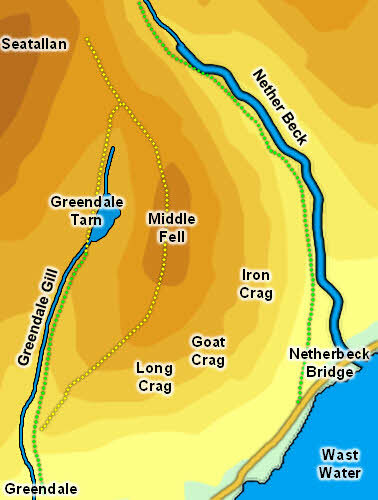 Greendale Gill plays the same role as Over Beck, Nether Beck becomes Mosedale Beck. Dore Head links to Wasdale Red Pike in a similar way to Middle Fell's link to Seatallan.